Tucked between the popularity of the early Rock and Rollers and the mid-1960s British Invasion was the phenomenon known as the “Girl Groups.” With names like The Shirelles, The Crystals, and The Marvelettes, they offered a style rich in vocal harmonies that was eagerly embraced by a wide audience. Today, in the nostalgic style people anticipate, Girls Night Out, by Titan Productions, reflects and era of music that people still embrace. With energy and harmonies that reflect the time, these same 4 groups continue to attract audiences from around the world, as they sing their hits from an age gone by. Shirley Alston Reeves started The Shirelles and sang lead vocals for the group. The Shirelles very first single release was “I Met Him on A Sunday. The Shirelles soon became known throughout the world when they placed six singles in the Top Ten. Songs such as ” Baby, It’s You” “Will You Still Love Me Tomorrow”, (written by Carole King), “Mama Said”, “Tonight’s The Night”, the soulful sounding “This Is Dedicated To The One I Love”, and, of course, the group’s 5 million selling hit “Soldier Boy” are etched in history and continue to thrill audiences. 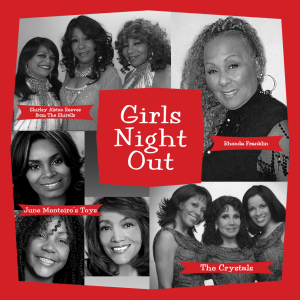 “Being a part of a legendary Girl Group of the Sixties was a dream come true for me!”, those were the words of June Monteiro of THE TOYS, The Legendary 1960s Girl Group, which also included lead singer Barbara Harris and Barbara Parritt. In 1965, THE TOYS topped the charts for six weeks with “A Lover’s Concerto,” whose instrumental track is based on a classical piece by Bach. The Group followed “A Lover’s Concerto” with a second hit, “ATTACK”. Through the ups and downs of her life, June has always remained in the Entertainment Industry. Currently, June, along with Carolyn Harding, and Debor’ah Evans, are hitting the stage again as June Monteiro’s Toys. The Crystals are an American vocal group based in New York, considered one of the defining acts of the girl group era in the first half of the 1960s. Their 1961–1964 chart hits, including “There’s No Other (Like My Baby)“, “Uptown”, “He’s Sure the Boy I Love”, “He’s a Rebel“, “Da Doo Ron Ron (When He Walked Me Home)” and “Then He Kissed Me“, featured three successive female lead singers, and were all produced by Phil Spector. The latter three songs were originally ranked #267, #114, and #493, respectively, on Rolling Stone magazine’s list of The 500 Greatest Songs of All Time. However, two songs were dropped from the magazine’s 2010 update. Rhonda Franklin has been singing her entire life, so it’s quite natural that she began pursuing a professional career shortly after graduating high school. Fast forward to the early 1990s and an appearance at the famed Apollo Theater in New York City. In the audience were representatives of the celebrated Marvelettes, who were in need of a singer. During their reign as reliable hit-makers, The Marvelettes scored more than a dozen hits, eight of which earned Top 10 honours, including their first record, “Please Mr. Postman”, a national Number One hit, generating sales in excess of three million. Rhonda is the first one to say, that she did not record on the actual hit records. During her years with The Marvelettes, Rhonda Franklin shared concert stages across North American with a “Who’s Who” of pop music royalty. Among those artists was the world famous Drifters featuring Rick Sheppard. After nearly a decade with the Marvelettes, Rhonda sought the counsel of her friend, Rick Sheppard. Together, they developed The Marvelettes Revue featuring Rhonda Franklin. Rhonda Franklin continues to perform some of the biggest hits made famous by The Marvelettes along with her unique vocal interpretations of pop standards from the 1960s and 1970s. Most often, Rhonda tours with The Drifters featuring Rick Sheppard. Always in evidence is Rhonda Franklin’s trademark performance: smooth, polished, energetic and thoroughly entertaining! !